On the 11th (Tue), take your sightseeing to a higher altitude at Kufri Fun World and then contemplate in the serene atmosphere at Jakhu Temple. For maps, other places to visit, and tourist information, go to the Shimla trip builder website . New Delhi to Shimla is an approximately 4.5-hour combination of flight and taxi. You can also drive; or do a combination of train and taxi. Wrap up your sightseeing on the 11th (Tue) to allow time to drive to Manali. 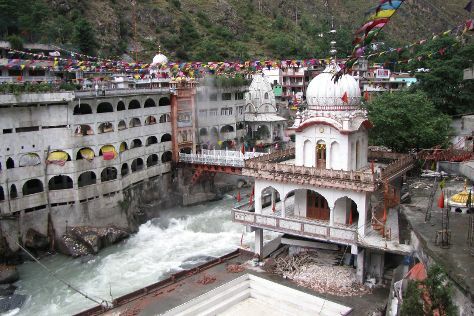 On the 12th (Wed), take in the spiritual surroundings of Siyali Mahadev Temple, contemplate in the serene atmosphere at Hidimba Devi Temple, relax and rejuvenate at some of the best spas, then appreciate the views at Solang Valley, and finally take in the dramatic scenery at Jogini Waterfall. Get ready for a full day of sightseeing on the 13th (Thu): take your sightseeing to a higher altitude at Keylong, then contemplate in the serene atmosphere at Himalaya Nyingmapa Buddhist Temple, then explore the fascinating underground world of Arjun Gufa, and finally explore the activities along Beas River. For maps, reviews, and other tourist information, go to the Manali trip website . Traveling by car from Shimla to Manali takes 4.5 hours. Alternatively, you can take a bus. Finish your sightseeing early on the 13th (Thu) so you can travel to Kasol. Kick off your visit on the 14th (Fri): tour the pleasant surroundings at Sar Pass Trek, witness a stunning natural landmark at Hot Water Spring, and then take in the spiritual surroundings of Sri Guru Nanak Devji Gurudwara. To find where to stay, more things to do, ratings, and tourist information, you can read our Kasol road trip planning website . You can drive from Manali to Kasol in 3 hours. Wrap up your sightseeing on the 14th (Fri) to allow time to travel to Dalhousie. On the 15th (Sat), hike along Ganji Pahari, take in the awesome beauty at Dainkund Peak, and then take in the architecture and atmosphere at St. John's Church. To see maps, reviews, where to stay, and other tourist information, use the Dalhousie trip itinerary maker . You can drive from Kasol to Dalhousie in 10 hours. Wrap up your sightseeing on the 15th (Sat) early enough to travel to New Delhi. Start off your visit on the 16th (Sun): contemplate the long history of India Gate, then admire the natural beauty at Humayun's Tomb, and then admire the natural beauty at Akshardham. To find maps, ratings, other places to visit, and other tourist information, you can read our New Delhi trip itinerary maker tool . Getting from Dalhousie to New Delhi by combination of taxi and flight takes about 5 hours. Other options: drive; or do a combination of taxi and train. In June, daytime highs in New Delhi are 45°C, while nighttime lows are 32°C. Cap off your sightseeing on the 16th (Sun) early enough to travel back home.